It was an early start each morning with breakfast at 8am. 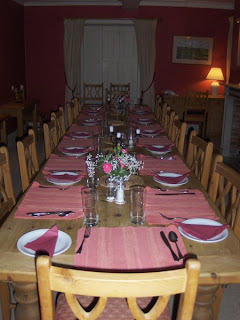 This is the dining room in the Farm House were all meals were had. The food was amazing. All vegetarian but really tasty. I think my favourite was the chick pea curry and the sticky toffee pudding with mascarpone and hot toffee sauce. 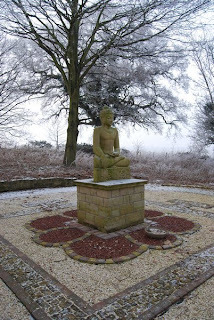 This is the Budda statue in the grounds of the retreat. We wandered round it when we went on our walk. 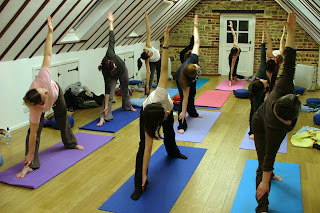 And of course there were some Yoga classes - Tadders and Me are in the middle row. This position is aptly named the triangle posture. This was part of the aromatherapy workshops. 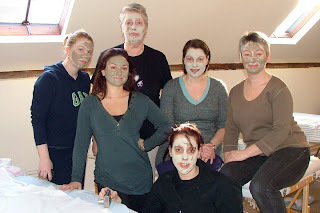 Our faces are covered in Green Clay which helps drawn out toxins and imperfections in the skin. No one can really smile as it was hard when the clay dried. Afterwards we received face massages with essential oils as the clay takes away a lot of the moisture in the skin. 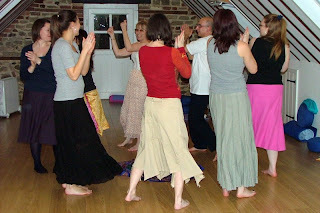 On the Saturday evening we took part in some circle dancing to traditional folk songs from various countries lead by Yogi John. I think my favourite is still the one from Greece as like Zorba's dance it progressively gets faster. We had an additional room mate on Saturday. 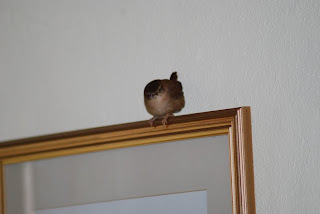 We returned to our cottage to find a little Wren flying around. He was quite determined to stay in the cottage in the warm. He eventually left the following morning. As far as we know he had a pleasant stay.